CO2 is the compound that is fundamental to the carbon cycle and, if there were no life on Earth, the CO2 levels in the air would mainly depend on volcanic activity, more or less balanced out by changes to silicates which, after being washed by rainwater containing CO2, can create carbonates which are themselves likely to be converted back into CO2 should they come into contact with volcanic phenomena. an injection of CO2 that creates an imbalance (because it is only partly compensated for by a subsequent attachment), created by Man’s activities: the burning of organic forms (wood) and fossil fuels (oil, coal and gas) or the decomposition of carbonated rocks (cement plants, lime kilns) releasing quantities of CO2 contribute to planet heating through the greenhouse effect. To the above, we need to add the different sources of methane that are naturally produced during anaerobic fermentation; thus, CH4 emitted by paddy fields and the stomachs of ruminants and by liquid manure constitute an additional factor that will affect the balance of this cycle. In water (figure 3), dissolved CO2 is in equilibrium with the atmospheric CO2 on the one hand and with the dissolved carbon species (HCO3–, CO32–) on the other. The greater part of dissolved mineral carbon is stored in the oceans. 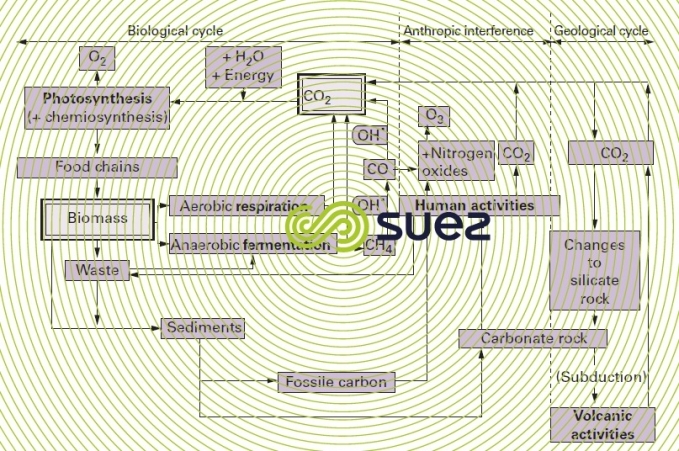 Dissolved mineral carbon is converted into organic compounds through the photosynthetic activity of algae and, to a lesser extent, through the photosynthetic activity of aquatic plants; the annual worldwide flow of carbon thus established is equal to approximately 60 billion tonnes per year (compared with 110 in the case of terrestrial plants). 80% off this amount is then discharged as CO2 through respiration and the remaining 20% as organic carbon, particulate organic carbon ( POC ) or dissolved organic carbon ( DOC ), consisting of secreted metabolites and excreted waste. The biomass stock that guarantees these flows collects the organisms responsible for primary production (the plants referred to above to which we have to add phototrophic or chemotrophic bacteria, see water and cell metabolism) and those found in the food chain (zooplankton, macro-invertebrates, vertebrates). The POC emitted during their lifetime and the substance produced by their cadavers (excluding a small fraction that drops down into the sediment, the ultimate carbon well in some cases), undergo bacterial decay through enzymatic hydrolysis, adding to the existing stock of DOC. Other forms created by terrestrial leaching and/or discharged with pollution (endogenous) have to be added to the POC and DOC produced within the water (exogenous). 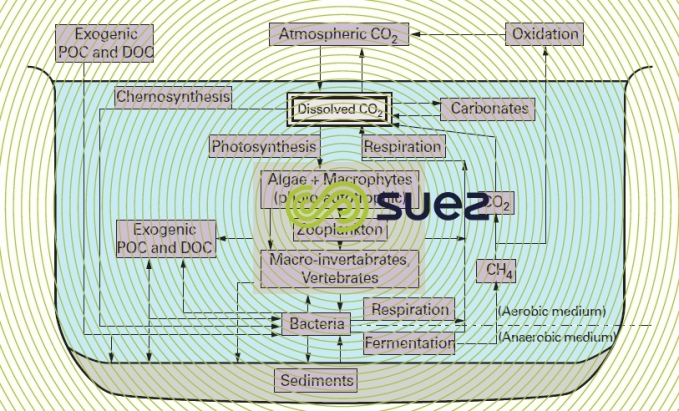 Case of CO2 and of CH4 in an anaerobic medium (fermentation) in the vicinity of and within the silt and sediment (especially in marshes), CH4 itself likely to be re-oxidised as CO2 in an aerobic medium. The CO2 regenerated by this mineralisation of organic matter can again be assimilated, closing the carbon's aquatic cycle.